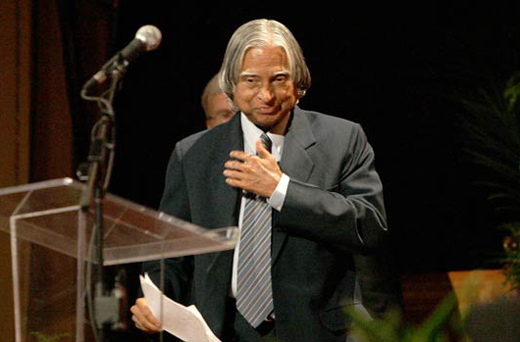 Former President APJ Abdul Kalam Dies in Shillong. Shillong, July 27, 2015: 11th President of India, APJ Abdul Kalam died on Monday evening at a hospital in Meghalaya, where he had gone to deliver a lecture. He was 83. The former President, who was in office from 2002 to 2007, had collapsed during the lecture at the Indian Institute of Management, Shillong, around 6.30 pm. He was taken to the Bethany hospital. Doctors said he had suffered from a massive cardiac arrest. "President Kalam was brought to the hospital at 7 pm. When he brought in there was no sign of life. He was taken to ICU to try and revive him, which was futile," hospital sources told NDTV. Paying a special tribute to Dr Kalam later in the evening, Prime Minister Narendra Modi said, "My mind is filled with so many memories, so many interactions with him. Always marvelled at his intellect, learnt so much from him." Home Minister Rajnath Singh tweeted, "Deeply saddened at the sudden demise of the former president of India Dr. APJ Abdul Kalam. He was an inspiration to an entire generation." You are a role model to every Indian. You are a inspiration to the entire generation. Your memories will linger in everyone’s heart. Miss you Sir.....Rest in peace. You are remembered by all Sir, because you are the one among the millions. The love and respect for you in our hearts will remain forever.He is a great loss to the nation. I wish may his soul Rest in Peace. He is our Icon and always in our heart. May his soul rest in peace. We are very sad for the sudden demise of our Former President Mr.Abdul Kalam. May his soul Rest in Peace. My sincere salute to a humble personity. You will always be in our hearts. Rest in peace. Mr.Kalam is asource inspiration to ever one in the country. May his soul rest in peace.